At Bluff Road Medical Centre we provide a comprehensive skin cancer screening and management service. Our team of skin cancer doctors are experts at identifying suspicious moles and lesions, and we also offer state-of-the-art digital imaging of your skin. We assess all forms of sun damage, including skin cancers such as melanoma, basal cell carcinoma, squamous cell carcinoma and solar keratosis. Why should you have a skin check-up? Australia has one of the highest rates of skin cancer in the world. In fact, two in three Australians will be diagnosed with skin cancer by the time they’re 70. For that reason, it’s extremely important to be vigilant about your skin and to have regular check-ups. The sooner a skin cancer is identified and treated, the better the prognosis. How often should you have a skin check-up? We recommend having a skin check-up once a year. If you are concerned about a mole or lesion that has changed in appearance, please make an appointment to see us immediately. Similarly, if someone in your family has been diagnosed with skin cancer, it may be a good idea for you to schedule a skin check-up. During your 30-minute appointment, your skin cancer doctor will undertake a detailed, full-body skin examination. 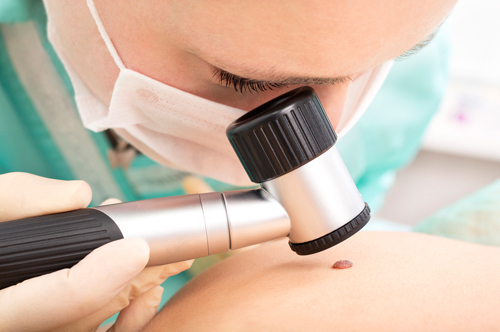 Moles and suspicious skin lesions will be checked, then photographed using our FotoFinder Digital Dermoscopy system. These images can be used for future reference at follow-up visits to monitor any changes. This technology is designed for early skin cancer detection, and is strongly advised for high-risk patients with a personal or family history of skin cancer. Patients are asked not to wear makeup or face creams to this consultation. Why choose Bluff Road Medical Centre for your skin check-up? We have Skin Cancer Doctors accredited by the Skin Cancer College Australasia. The imaging we provide is not routine, and is usually undertaken at skin cancer clinics. At Bluff Road Medical, we offer GP services and skin check-ups all conveniently under the one roof! Our Sandringham skin doctors have undertaken advanced study to specialise in this area. We see high volumes of skin cancer, so we know what to look out for when it comes to identifying suspicious lesions and moles. What’s more, you won’t have to wait months to see us for your skin check. If your doctor is concerned about a particular mole or lesion, they may suggest a biopsy to determine whether it is cancerous. This can be performed on-site at our clinic. We will take a small sample of the mole, then send it away for testing. For more details about accessing test results, please click here. If the mole or lesion is malignant, our doctors can remove it on-site via surgery. We can remove most types of skin cancer or moles at our Sandringham medical clinic. Your doctor can explain the cost, results processing time and anticipated downtime (if any) to you during your appointment. Dr Nicholas Kokotis, Dr Kachig Malyan, Dr Krish Dinesh, Dr Jenny Kimmins and Dr Mary Fonti have conducted more than 30,000 skin examinations since commencing this skin surveillance service. Please make an appointment at our Sandringham medical clinic by calling 9598 6244.